With the vision to ‘face the world’, the Homan family have created a perfect property for their family, located on the island of Hvasser. 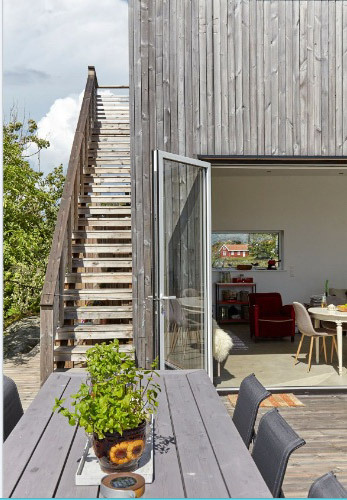 Owing to the island’s dramatic weather and the cabin’s exposed position by the sea a low maintenance wood which would withstand all weather conditions was required. As a result Kebony, a beautiful wood recommended by leading architects, was selected for the cabins façade. 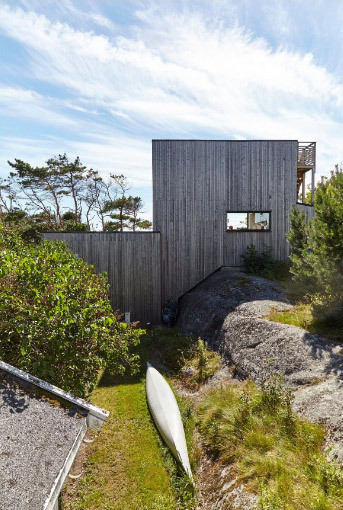 Designed by architect Pernilla Johansson, the striking cabin was intended to stand out from the more traditional cabins in the area. However, the owners also believed it was essential to look to the future and build a cabin fit for the modern day, with the capacity to cater for the needs of their dynamic family. Throughout the summer, the family is able to embrace outdoor life from the roof terrace which offers a breath-taking view of the cabin’s natural surroundings. 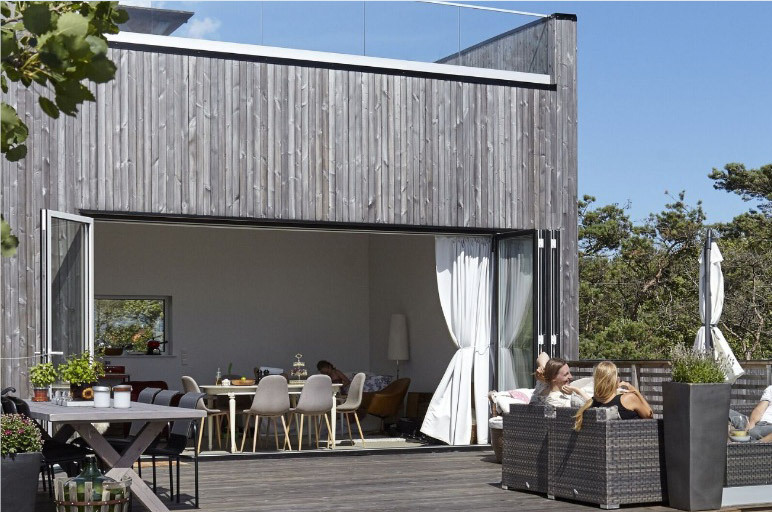 The terrace is constructed with closely set railings which work as an extension of the walls to create a sheltered lounge suitable for southern Norway’s famously unpredictable weather. 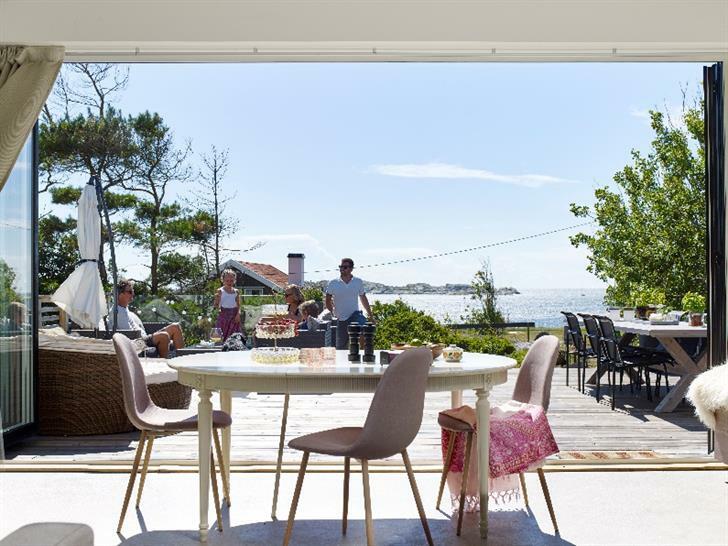 When the weather does close in the sliding doors leading out to the terrace are pulled to, ensuring the family can enjoy the magnificent view, regardless of the weather. After prolonged exposure to the elements, the Kebony wood has adopted a silver-grey sheen which has enabled the cabin to replicate the colours of the natural rock beside the property, ensuring the cladding and terrace decking blends seamlessly into the terrain. The weathered patina enhances the appearance of the untreated wood without affecting the woods durability and dimensional stability, demonstrated perfectly at this cabin. 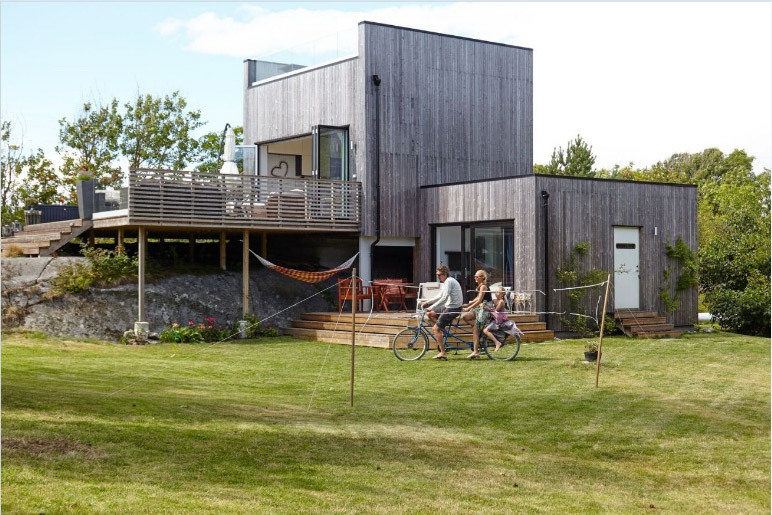 As an environmentally friendly product, Kebony was carefully selected for the wooden façade primarily due its sustainable nature; in addition it was particularly beneficial that Kebony requires no maintenance beyond normal cleaning, with a 30 year warranty even in Nordic climates. Spending quality time as a family was a key priority for the owners of this house who enjoy long walks in the area and did not want to be tied to a paintbrush, as such it was integral that the materials chosen for the house required as little maintenance as possible.